​Tara Lynne Groth is a freelance writer in the Raleigh, North Carolina area. She writes SEO content (search engine-optimized web content) and provides content marketing services to help businesses attract and retain their target clientele. As a resume writer, Tara Lynne helps individuals clearly quantify, explain, and format their professional experience to better support their career goals. In addition to resume writing, she also advises on LinkedIn profile optimization by using her SEO background and knowledge of LinkedIn's search utility. ​When it comes to freelance journalism, her bylines have surfaced in GRIT, Produce Business, Next Avenue, Market Watch, Chapel Hill News and more. 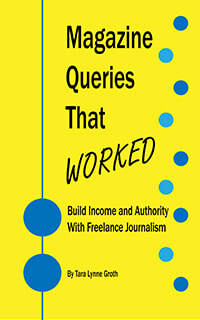 Her book, Magazine Queries That Worked (June 2017), is a guide for freelance journalists. Tara Lynne is founder of Triangle Writers and Asheville Writers, creative writing groups with more than 1,600 members collectively. She also supports Raleigh's largest group of poets, Living Poetry, with open mics and workshops. Tara Lynne writes short fiction and poetry and has authored three poetry books. She is actively seeking representation for a short story collection.